Facebook has launched a basic Pocket competitor called Save. It’s a feature for iOS, Android, and web that lets you store links from News Feed and Facebook Posts, Pages for Places, Events, Movies, TV shows, and music to a list where you can view them later. While Save doesn’t cache content behind links like Pocket or Instapaper, it should give all Facebook users a quick way to stockpile links and content they find so they don’t have to interrupt their News Feed reading flow. As it rolls out over the next few days, Save could let people browse the feed in shorter bursts without worrying about forgetting things they don’t have time to explore right away. The “Save” button or a little bookmark icon button resides in the bottom right of stories in the mobile and web News Feed, and you can also Save by using the drop-down menu accessed from the arrow in the top right of each story. 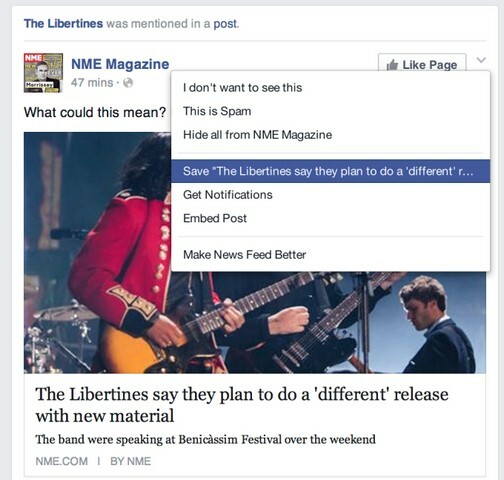 On Facebook Pages for Places, Movies, TV shows, and musicians, as well as Events, there’ll be a more prominent Save button next to Like or the RSVP options. A link to Saved items appears in the web homepage’s left sidebar list of bookmarks, and the More apps list on mobile. That More list is where features like Nearby Places and Nearby Friends have been buried, and Save too could get forgotten by average users. What you Save is only visible to you. From your Saved list which is categorized by content type, you have the option to share an item with friends, or archive it. You’ll need web connectivity to visit any links you Save, as Facebook isn’t currently caching them. Facebook will remind you to check out what you’ve stored with occasional News Feed posts featuring carousels of your Saved content. When you save things on Facebook, they’ll appear in your Saved Items that only you can see. Going back to read links you didn’t have time for makes sense, and Saving Places could help you compile restaurants and attractions to check out in your city or while traveling. But I’d bet few people will use Save to store movies and TV shows to read later. How hard is it to remember “everyone says I should watch Game Of Thrones”? And you can just RSVP “Maybe” if you’re considering going to an event, unless you’re really paranoid and like to travel by cover of darkness. You can archive or delete the things you’ve saved. Who can see the things I’ve saved? Only you can see the things you save on Facebook to view later. 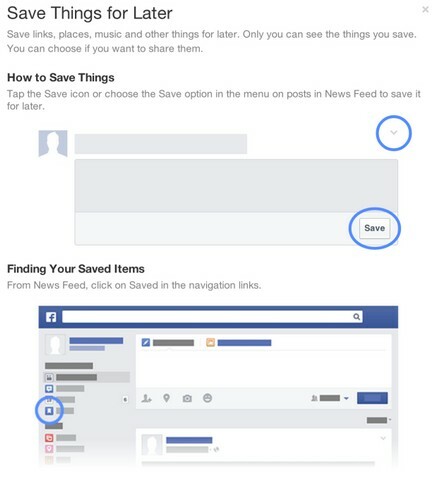 Learn more about saving things on Facebook.